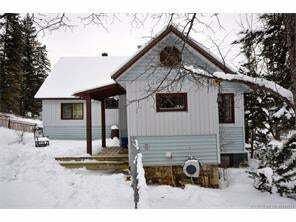 Looking for a home base in Parson BC which offers quick access to endless recreating possibilites? Just five minutes from the Columbia River, this 4 bedroom, 1 bath home can open the doors for Downhill and Backcountry Skiing, Hiking, Climbing, Mountaineering, Kayaking, Sledding (SilentPass), Boating/Waterskiing, and Road or Mtn Biking. Great fishing at Mitten Lake in the Purcells is only 15 minutes away! The Bugaboos, RogerPass, Yoho and Kootenay parks are all close by. The home is nicely upgraded with crown moldings, window moldings, and baseboards. There is a newer stone tile floor and granite counter top kitchen with island. The kitchen has matching stainless steel 24 Gas Range, Dishwasher and Fridge and is tastefully decorated. The property sits on a small hill and is .42 Acres with a large outdoor covered workshop with double garage door, lighting and power. There is a large chain-link fenced area surrounding the front lawn for pets.